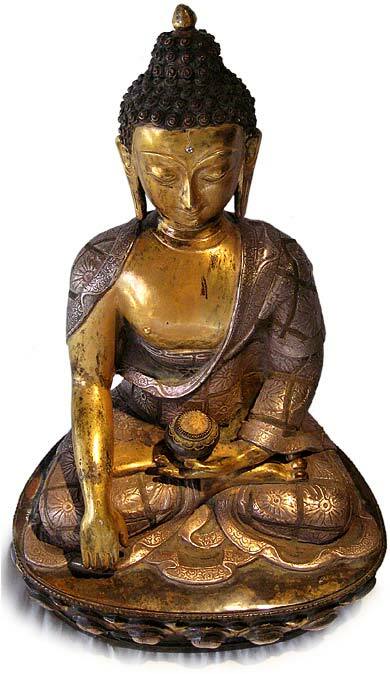 This Tibetan 19th century gold silver bronze Buddha is exquisitely rendered in high detail. The slightly tilted posture holds a deep pose of equipoise: the balance between worlds, the presence of equanimity. 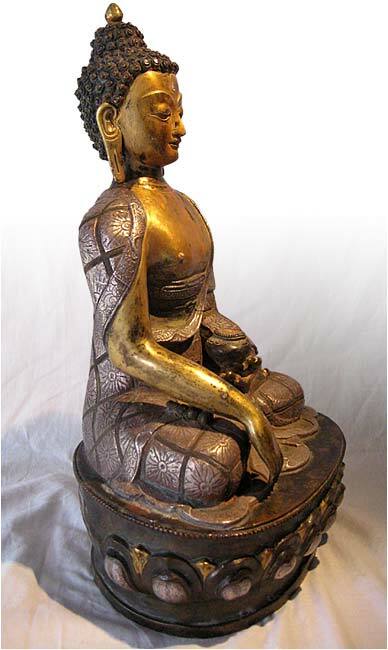 In his right hand this prince turned Buddha holds a medicine bowl overflowing with healing nectar (amrita) that cures all ills, the mental afflictions that are said keep us in the round and cycle of samasara, rebirth as a cause of ignorance. 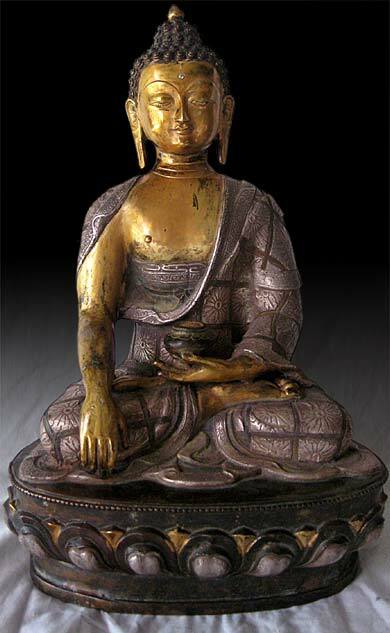 This Buddha’s countenance is peaceful, eyes down cast in deep contemplation. His forehead is accented with a silver third eye, ajana chakra, that is mirrored by the gilt accented topknot that indicates his connection to heaven. His right hand touches, the Earth a recognition and offering of his awakened state to the earthly plane. The ears are markedly elongated. 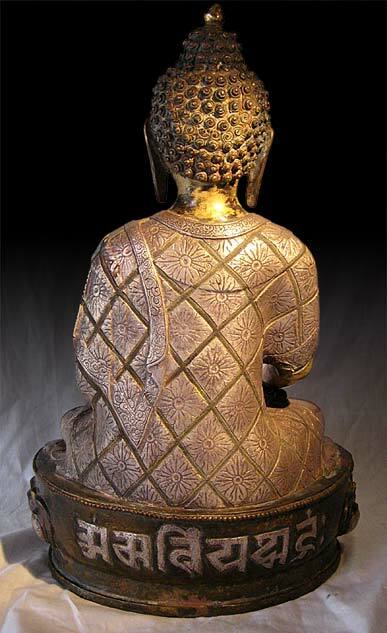 This Buddha sits on a finely tooled lotus pedestal marked in the back with mantra. His robes are rendered in high detail, the folds sumptuous, the textile details distinct. 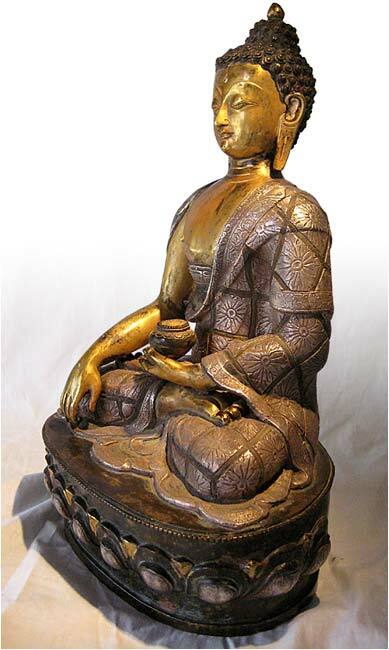 This Tibetan bronze is in excellent condition, a fully rendered depiction of this seminal figure.